This week’s Torah portion begins with a description of the infamous red heifer – that most inscrutable of all ancient Israelite sacrifices. Generation after generation of commentators have puzzled over the meaning of this mysterious ritual, which seems to defy rational explanation at every turn. What on earth do we make of sacrifice that makes the impure pure, but in so doing renders the pure impure? Let’s look first at the ingredients of the sacrifice. Symbolically speaking, it’s noteworthy that both hyssop and cedar are used – as both have been historically connected with healing, cleansing and protection. Among their Biblical associations, hyssop was famously used to mark the Israelites’ doorposts with blood in Egypt, and cedar wood was a central material used in the building of the Temple in Jerusalem. At the same time, however, these plants are polar opposites: the hyssop is a lowly shrub associated with humility while the cedar is a massive, towering tree that commonly represents majesty and pride. The color red, of course, has many popular associations. Generally speaking, red symbolizes love, sensuality, emotion and passion. Red is also the color of blood and fire, both of which are central to life itself. As the primary color of the sun, it is associated with the life-giving energy that animates our world. 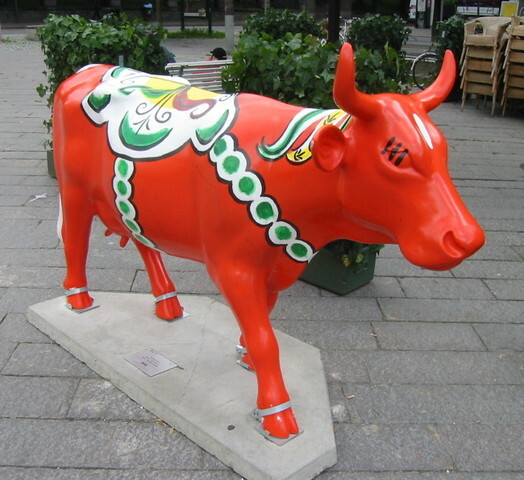 The 16th century Italian Torah commentator Sforno famously interpreted the red of the red heifer to represent emotion or passion taken to an unhealthy extreme – and that the symbols of hyssop and cedar indicate that one can engage in unhealthy extremes in either direction: humility/self-abnegation or pride/ego. To further paraphrase Sforno, the ashes of the red heifer serve as a kind of “extreme ritual therapy” designed to help someone who dwells in the extremes to attain the “golden mean” – or a place of spiritual equilibrium. However, in order to facilitate this ritual, the priest must themselves go into those extreme places himself – and in so doing, his own equilibrium will be affected. That is why the Torah prescribes a rite of “purification” for the “purifier” as well. – In what ways do we find ourselves charting more extreme terrain – and to what extremes must we go to return to balance and equilibrium? – What must we do to help others who might inhabit this territory – and what must we do for ourselves to find our way back? this reminds me of the teachers, sponsors, and mentors i have invited into most every area of my life. in my intimate work with people, and in the safe place i create for them, i can easily take on residue of what they are releasing. in bringing these experiences to my “guides,” i am able to shed what i have taken on…and to trust that they will do the same, on up the line. i am reminded of why we don’t do any of this alone.